Just as the history of conventional sports is essentially a history of cheating, the same is true of gaming. In the modern day, though, with billions of dollars involved in competitive gaming, cheating is shadier, more consequential, and involves rewards far greater than the free lives offered up by the infamous Contra code. In the interests of journalism, I decided to find out all about it by repeatedly attempting to cheat at League of Legends. In doing so, I learned a lot more about the possibilities and difficulties, and the commercialized industry that’s formed up around getting you a free kill in your next ranked League match. League of Legends was my game of choice because I’m familiar with it, and also because cheating seemed fairly straightforward. My goals were simple: Cheat without getting caught. While games like Counter-Strike: Global Offensive offer plenty of tools like aim-bots (which automatically point your crosshairs at enemy heads) or wall hacks (which let you see through walls), it’s fairly easy for players using them to get caught and banned by Valve’s anti-cheat software. The tools in League are a little different. 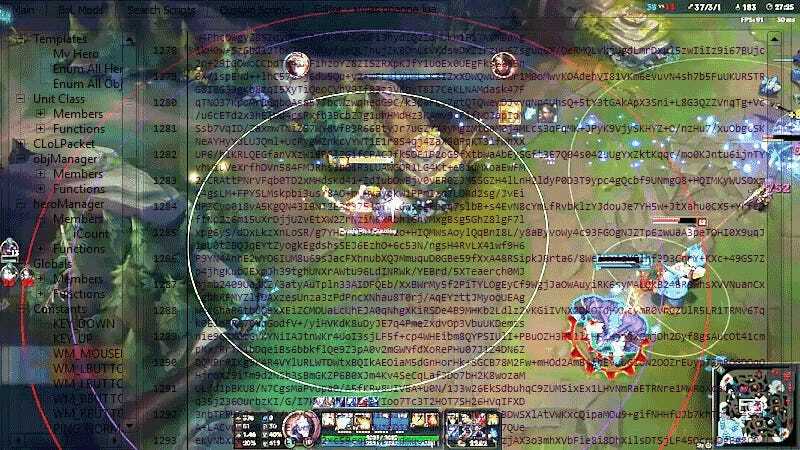 They’re referred to as scripting and involve a program injecting code into packets sent by the League client, or requesting certain info from the server that the client wouldn’t otherwise. In small cases, this can mean queueing up inputs to execute them at optimal speed, like a perfect Lee Sin ward-hop pulled off in a single button push. In more extreme cases, it means tools that give you the last known locations of champions, or telegraph moves, or even auto-dodges skills like Blitzcrank’s hook for you. This evade program automatically dodges attacks for you, even displaying boxes to show their area of effect. When researching which tool I’d start with, I found a number of sites. Formerly, LeagueSharp was the agreed-upon industry leader, but a recent settlement with Riot Games left them gutted and out of the game. I considered a few options before settling on two: Bot Of Legends, which advertised both botting services capable of auto-leveling accounts and scripting, and ELOBuddy, which offered a suite of community-created scripting tools. I learned a lot over the course of the next few days in my attempts to cheat on an alternate account. (I’m not burning my main, sorry.) The first thing I learned was that with Bot Of Legends, after running through the install, it was fairly difficult to actually start getting the gears in motion. My testing ground of choice was going to be Ezreal, an accuracy-dependent marksman who utilizes a lot of different mobility tools and aimed attacks. Not only was he the most direct way to see results—I’ve played as him in the past and his kit lends itself well to robot-influenced optimization—but he was also in the free rotation of champions that week, so my burner account could instantly access him. Pulling down community-made scripts for Ezreal was an endeavor. All of them advertised features; none of them came with a user’s manual. While the plug-and-play nature of the mods was nice, there was no clear mark for telling me whether the client was receiving my input. I flipped on a couple usability tools, as well as my Ezreal pack, and jumped into my first game, ready for the Riot police to come break down my door at any moment. And they did. Or, at least, I think they did. On the first boot of the game, it crashed. Oh, I thought. Maybe something didn’t install right. Maybe it’s a fluke. Nope. Every instance of every game I tried to boot with Bot Of Legends running crashed my game. It didn’t matter what mods I had installed, which ones were on or off, or even if I was playing the right champion; across all my test games, Bot Of Legends being active on my computer crashed my League of Legends game every time. Add on hat my Windows Defender was getting irritated about some malware it thought I had installed, and I moved on to option B: ELOBuddy. Where Bot Of Legends was user-ambivalent if not user-hostile, ELOBuddy made it a bit easier for me to jump in and start modding. That should be no surprise, as ELOBuddy’s main service is a subscription; though it boasts offering a free version as well, the “VIP” edition encourages users to pay up monthly for its best options, including VIP-exclusive scripts. A screencap of the BoL editor, where scripts can be injected and edited. I’m not in the business of giving a scripting company my cash, so I opted for the free version, and gave ELOBuddy the same fake, temporary email account I fed Bot Of Legends. Though it accepted my sign-up, after adding my Ezreal mods of choice and booting up League of Legends again, it crashed my instance, this time giving me a very specific message: I would have to wait until the next day to make use of ELOBuddy. Account restrictions make some level of sense. I played my game script-less and carried on with my day. A day later, I found out my ELOBuddy account was banned. And in further attempts to create accounts, any I made on or tried to access from this computer received a ban as well, even when made with proper, long-standing email accounts. It seems either I have a nasty streak of luck, or ELOBuddy’s security measures are fairly solid. So, in the end, my cheating venture ended in absolute failure, but I learned a few things. Cheating is surprisingly difficult, as the measures put in place by Riot Games seem to be giving the scripters problems. Forums have announcements for every patch, and with each new iteration the time gap between the League of Legends patch hitting and the scripters beating the security measures widens. Scripting can be dangerous, at least for your computer’s health. I was surprised to see only one instance of malware detection, but I purposefully avoided a good few suspicious download links, through tactics I learned in a youth of downloading viruses and then haphazardly trying to rectify the situation. A younger me would have run into a bit more trouble. The biggest surprise, though, was how commercialized the scene was. Almost every service I looked into offered some level of subscription for their services. While some had a free version available, they usually offered significantly fewer features, and part of me suspects my difficulty in getting the scripting to work was due, at least in part, to not being a paying customer. A few torrents I eyed on the way down to cheat-town boasted names like “ELOBuddy-Cracked.” Usually, torrenters cracking and uploading your service means you’ve reached a certain level of market demand. So while I might be the world’s worst cheater, I at least learned something: That $10 million settlement in the Leaguesharp case might not have been as over-the-top as I had initially thought. It’s no surprise that sites like these keep popping up like hydra heads, each boasting their own suite of community tools and scripts, at reasonable-enough rates to hide on your parents’ credit cards.